In Leiden University in the Netherlands, there is a wonderful collection of over 100 alchemical manuscripts collected by Isaac Vossius the court librarian to Queen Christina of Sweden. Among these is Codex Vossiani Chimici F.29, which has many coloured drawings, versions of the Aurora consurgens and the Buch der heiligen Dreifaltigkeit. One of these caught my attention. Coincidentally, it links in with the Sturtz image we have also looked at. We see a king seated in the branches of a tree holding his orb and sceptre. A young archer is in the act of shooting him with an arrow. At the foot of the tree we see the dead king lying in a stone sarcophagus. From this a soul like form rises up and is met by another soul or spirit form descending from the heavenly world. We see within the clouds this heavenly world in which are three figures. The body of the dead king appears to be transformed through this interchange with the heavenly world. This death of the king is a well used theme in alchemy. 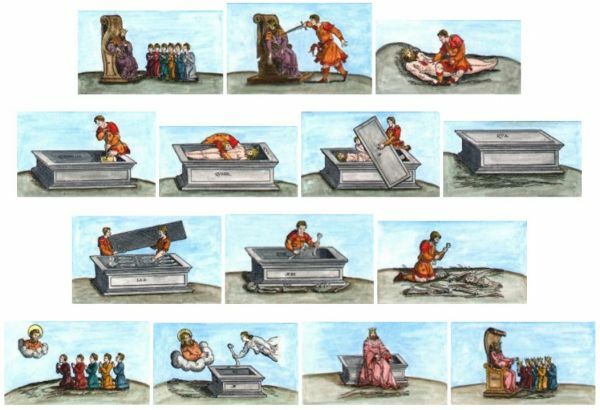 The sarcophagus has four taps. Liquid from these is flowing out and pouring into four columns. These are coloured with the well known stages of alchemy: Citrine (the yellowing); Albedo (the whitening); Rubedo (the reddening); and Nigredo (the blackening). A man and a woman stand beside these columns holding the golden keys to alchemy. The man has the Sun and a golden lion on his side, while the woman has the Moon and a white ram. This image is in a sense a reworking of the idea presented in the Petrus Bonus series, though in a way summarising that entire series of fourteen images. I will show this series below. 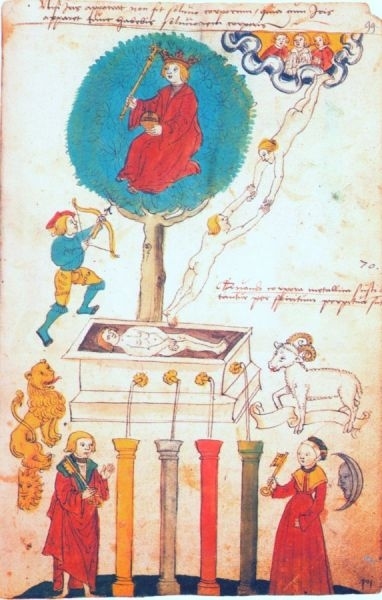 It also links to the Rosarium Philosophorum, in particular to the parts of the sequence where a soul figure rises from the dead figure in the grave and returns back again.